Organizations around the world have become aware that a data-driven approach is crucial to success. Whether it’s corporates seeking a competitive edge or governments looking for a sharpened focus on their development agenda, the merits of data have been proven time and again. Today, we have a mountain of information available wherever we look. However, it’s easy to go down blind alleys and reach dead ends if we don’t have an adequate framework to help us put all these pieces of information in place and begin our analysis with a coherent plan. The MECE framework is an excellent tool that can help you do just that. MECE (pronounced me-see) is an acronym for “Mutually Exclusive, Collectively Exhaustive”. The concept is just as simple as it sounds. Every point on the list must be mutually exclusive — there should be no overlaps and every item must be independent of each other. Also, all the items on the list together must be collectively exhaustive and express the information in its entirety — no possibility must be missed, so the list must account for all conceivable scenarios. The idea behind MECE applies whether you’re categorizing information, processing data, formulating problem statements, or proposing solutions. MECE is essentially a thought-process that keeps ideas from getting muddled up. What makes the MECE framework so effective is that, once the ideas have been categorized in this manner, they readily lend themselves to thorough, in-depth analysis. You can probe every listed line of thought down to its logical conclusion without fearing the implications that it may have on the other items on the list. Clear segregation at the top goes a long way. Breaking a larger problem down into smaller, distinct chunks will help you attack the issue boldly and reach a solution much quicker than you might otherwise have. Adopting a MECE framework while conducting a survey to collect data or even while communicating the results of an analysis makes the resulting ideas easier to comprehend and absorb. Let’s have a look at some case studies that showcase the effectiveness of MECE in different contexts. The problem of categorizing school kids into houses when they join school give us a great platform to illustrate what’s MECE and what isn’t. A grouping mechanism that categorizes students based on their skills — singers, dancers, actors, and athletes — is clearly not mutually exclusive. There could be many bright kids who are proficient at several of these skills. Besides, the list isn’t collectively exhaustive either. Where are the poets and the painters? The list isn’t MECE and this scheme of categorization has failed us. Grouping the students based on their region of birth (North, South, East, and West) or their zodiac signs is MECE — every category is mutually exclusive and their contents are collectively exhaustive. However, this is not an ideal way to classify students. It looks like we’ll have to make do with random allocation of colours to designate the groups (which is MECE) until we can find a sorting hat to help us out. Though this example seems very simplistic, it is applicable to more complex examples. Organizing your data in a MECE framework will help you drill down your analysis with maximum clarity and thoroughness. This list is MECE – mutually exclusive since none of the points overlap and collectively exhaustive since you have satisfactorily managed to advise the restaurant on every issue at hand. Throwing in another recommendation into the mix such as “Find a new chef that specializes in making Rajasthani delicacies” would mean that the list is not MECE anymore; this recommendation overlaps with the first item on the list. If you wish to increase the granularity of your solution, do so using sub-points as below. This will help you maintain a MECE framework. Adopting the MECE framework is equally crucial while listing down the problems that need to be targeted at the beginning of a study, giving it a much needed direction and precision of scope. While designing your questionnaire, it is important to ensure that all the questions and sections are mutually exclusive and collectively exhaustive. To make a survey mutually exclusive, no two questions should be repeated. To be collectively exhaustive, questions should be chosen in a way that, together, they capture all the required information. It is important to note that the MECE framework applies to both questions and answer choices. Consider the following two questions and see whether they are MECE. Q1: What is the educational status of all the members of the household? Q2: Name the highest educated member in the household. These are not MECE because we can capture the information needed in Q2 in Q1 itself. We don’t need another question. These questions are not mutually exclusive. Another example seen during field research is a question that asks the respondents both the colour of their ration card and their poverty status. This approach is not MECE since the colour of the ration card automatically signifies poverty status. Similarly, in a survey with multiple sections, asking for someone’s occupation in the first “Basic Information” section, then asking if someone is a farmer as the first question of the “Farming” section is not MECE. The data points that these questions seek are not mutually exclusive. Asking non-MECE questions is an issue because it results in repetitive questions. These waste the surveyor’s and respondent’s time while providing an opportunity for bad data (if the answers to these two questions are different). The answer choices are not MECE since they do not consider people who belong to other religions — Jains, Zoroastrians, etc. This means that the list is not collectively exhaustive. Here, the answer choices are MECE. The entities on the list are mutually exclusive and they cover all possibilities. An easy way to ensure that a multiple choice question is collectively exhaustive is to add the option “Other”. If the enumerator chooses “Other”, you can ask the question “If other, please specify”. MECE can be a simple way to organize your thoughts in everything you do. I have known people to create their grocery lists and leave voicemail messages using the MECE framework. Whether or not you decide to take this approach that far, MECE is a very powerful tool that has the promise to make collecting data, categorizing data, and communicating solutions more efficient. 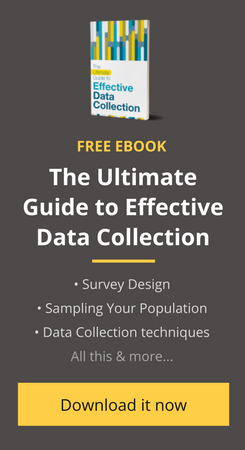 To learn more about how the MECE framework can help you build great surveys and collect better data, check out our ebook. We’ve devoted a full chapter to exploring the MECE framework.